Seats For Two took advantage of half the price deal, Wing Tuesdays at Buffalo Wild Wings. Offering 12 signature sauces and 5 dry seasonings including the house favorite Asian Zing, subtly sweet Honey BBQ, the buttery Buffalo, the tropical taste of Mango Habanero, and Asian flavors infused in Thai Curry. 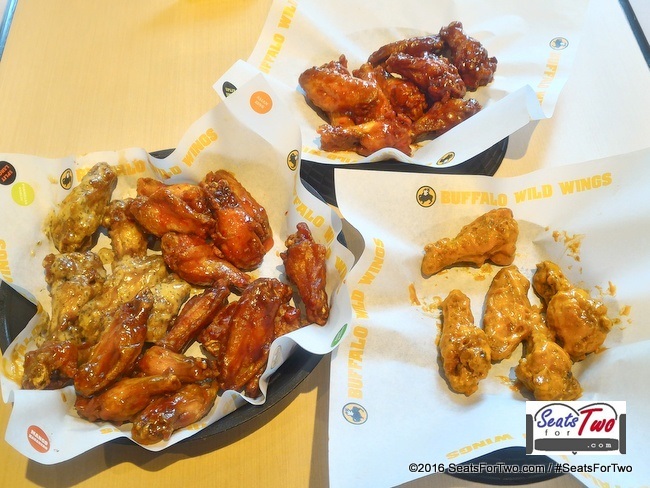 From 12 variants, our favorites are the lemon pepper, Asian zing and saucy Parmesan garlic. 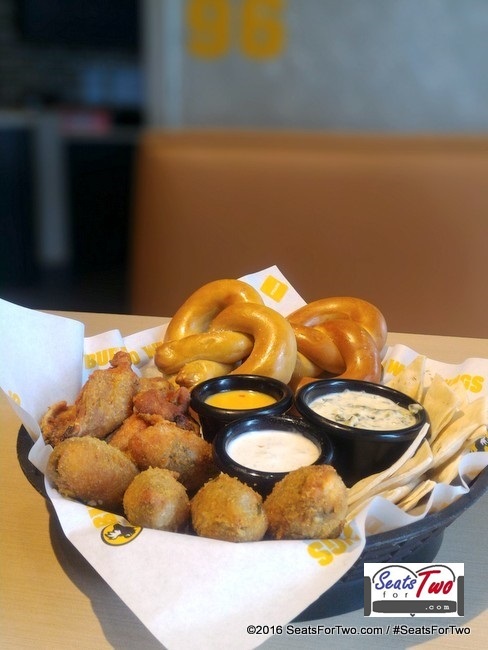 Aside from their flavorful wings, we had the sampler platter that comes with buffalo wings, warm soft pretzels and mozzarella sticks served with southwestern ranch dressing, savory spinach and artichokes dips. 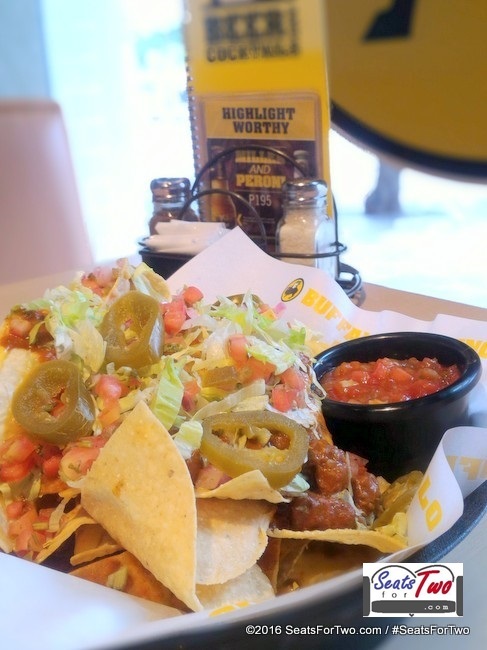 We also enjoyed munching on warm corn tortilla chips loaded with chili, house-made pico de gallo, shredded lettuce, fresh jalapeños, queso and salsa. 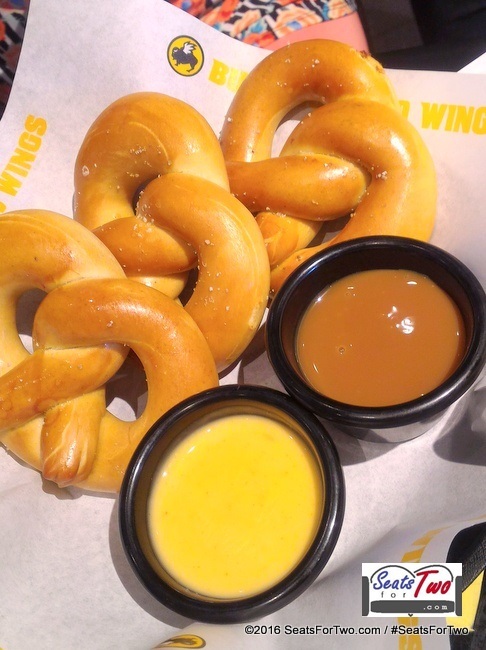 Mrs. SeatsForTwo loves the soft pretzels with caramel sauce. For those who are up for the challenge, join the blazin’ by downing 12 wings (that would get you from smilin’ to screamin’) in six minutes to become a “Blazin Challenge” champion. 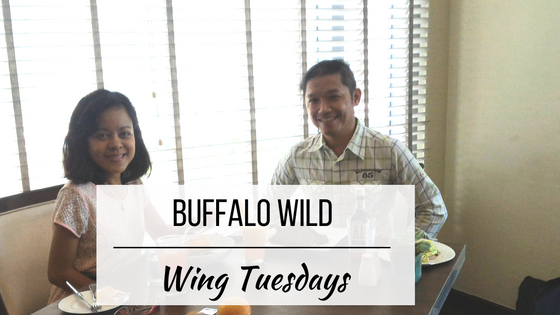 Buffalo Wild Wing Tuesdays will be available for a limited time only, all Tuesdays of October at Buffalo Wild Wings Estancia Mall. If you’re coming with your friends and big family, we suggest getting two large platters of 20 wings which cost only P572++ per large serving. 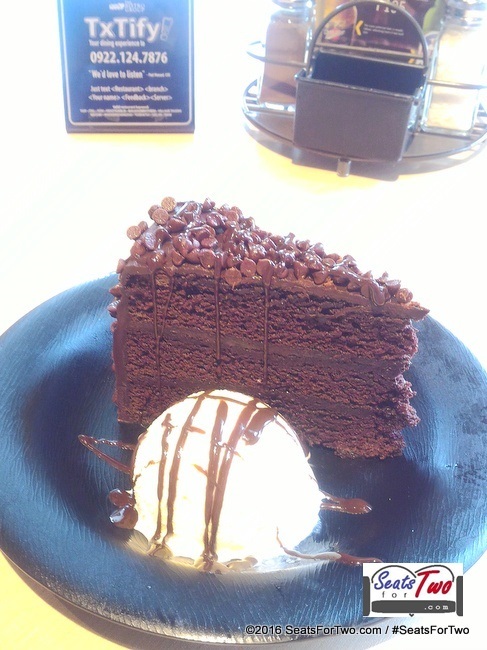 Capping our Wing Tuesday are two decadent dessert – cheesecake and chocolate fudge cake. 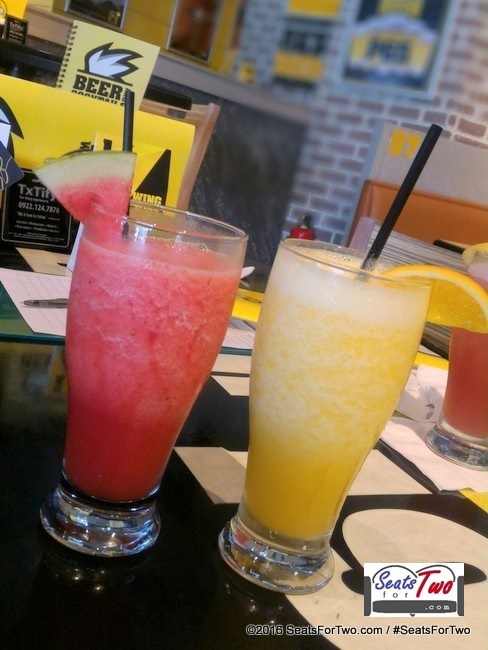 Buffalo Wild Wings is one of the several restaurants under the Bistro Group of Companies along with Italiannis and Krazy Garlik just to name a few.